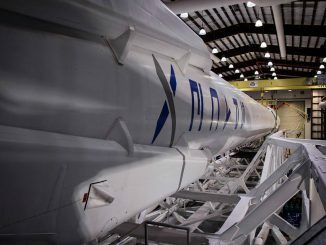 A multipurpose communications satellite owned by a South Korean telecom company is set for liftoff Monday from Florida’s Space Coast aboard a SpaceX Falcon 9 booster, and forecasters predict near-ideal conditions for a rocket launch. 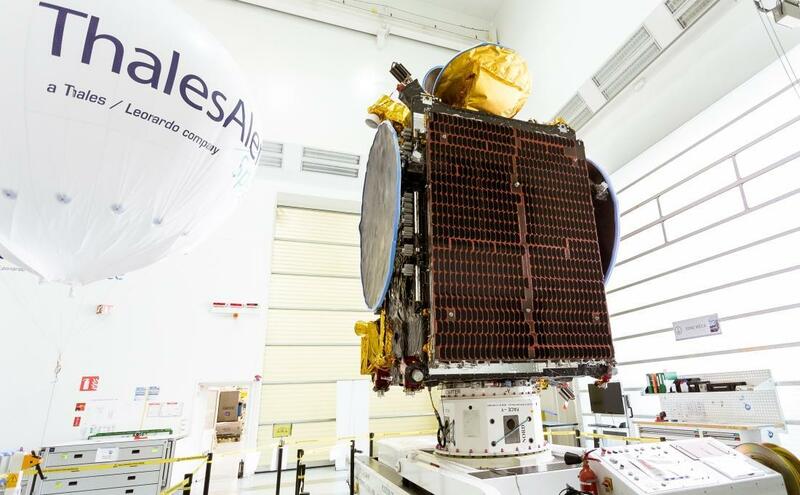 The Koreasat 5A spacecraft, manufactured in Cannes, France, by Thales Alenia Space, was being attached this weekend to SpaceX’s Falcon 9 rocket inside the company’s hangar near launch pad 39A at NASA’s Kennedy Space Center in Florida. Once technicians complete final closeouts, the Falcon 9 will be rolled up the ramp to the historic launch pad via rails aboard a transporter-erector, then raised vertical ahead of Monday’s countdown. The launch window Monday opens at 3:34 p.m. EDT (1934 GMT) and extends until 5:58 p.m. EDT (2158 GMT), and the official weather forecast issued by U.S. Air Force meteorologists suggests mostly clear skies and favorable conditions are on tap for Monday afternoon. There is less than a 10 percent chance that weather will prohibit launch. The only minor concern is with brisk northerly winds expected Monday. Tropical Storm Philippe moved northeast off Florida’s East Coast early Sunday before dissipating into a remnant low pressure system, and a cold front has also passed over the launch base, leaving fair weather in its wake. Conditions are launch time should be mostly sunny with a few clouds possible at 2,500 feet, good visibility, northerly winds of 15 to 20 mph, and a temperature of 69 degrees Fahrenheit. SpaceX’s launch team will oversee an automated countdown sequence Monday, beginning with power-up of the rocket and tests of telemetry connections. 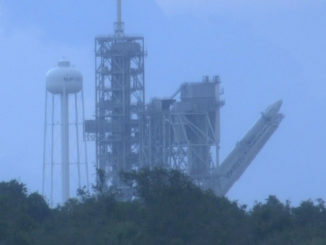 A poll of the team by SpaceX’s launch conductor is scheduled at 2:21 p.m. EDT (1821 GMT), followed by the start of propellant loading three minutes later. Super-chilled RP-1 kerosene and liquid oxygen will flow into both stages of the Falcon 9, along with high-pressure helium, to power and pressurize the rocket’s Merlin engines. The kerosene and oxygen will be cooled close to their freezing points, increasing the fluid’s density and allowing more propellants to be loaded into the rocket, a performance-raising technique introduced by SpaceX in 2015. RP-1 will be pumped into the rocket first, followed by the start of liquid oxygen loading at around 2:59 p.m. EDT (1859 GMT). The tanks will be topped off in the final stages of the countdown, and the first stage’s nine Merlin 1D engines will be conditioned for ignition by flowing some of the cryogenic propellant through their plumbing. The computer-controlled countdown sequencer will also command a final steering check of the rocket’s upper stage engine, pressurization of the Falcon 9’s propellant tanks, and the retraction of the strongback support structure into position for engine start. The first stage’s Merlin 1D engines will ignite at around T-minus 3 seconds, and hold-down clamps will open when the countdown clock reaches zero, after a last-second readiness check by the Falcon 9’s on-board computer. Heading east from the Kennedy Space Center, the 229-foot-tall (70-meter) Falcon 9 will surpass the speed of sound in about one minute and climb into the stratosphere atop 1.7 million pounds of thrust. The first stage engines will switch off and the booster will fall away approximately two-and-a-half minutes after liftoff, then fire nitrogen cold gas thrusters in a flip maneuver to point its engines forward. Four aerodynamic grid fins will deploy from the booster, and a subset of the first stage engines are programmed to ignite a few minutes later, combining to steer the rocket toward SpaceX’s drone ship — “Of Course I Still Love You” — floating in the Atlantic Ocean a few hundred miles east of Cape Canaveral. The first stage’s center engine will ignite again as the rocket makes its final descent, and hydraulic actuators will extend four landing legs just before touchdown. If all goes according to plan, the first stage will land on the recovery barge around eight minutes after liftoff, completing this booster’s first trip into space and back. While SpaceX’s rocket landings have captured attention and are key to the company’s strategy to reuse Falcon 9 boosters, the main goal of Monday’s flight — like all of SpaceX’s missions — is the deployment of its commercial payload in orbit. 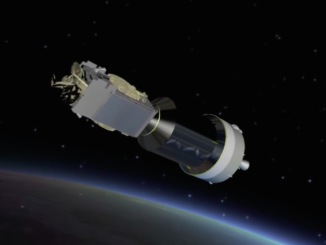 That will require to firings of the second stage’s single Merlin engine, first to place Koreasat 5A in a parking orbit, then to propel the spacecraft into an egg-shaped transfer orbit arcing more than 30,000 miles above Earth. Deployment of the 4.1-ton (3.7-metric ton) spacecraft is scheduled about a half-hour into the mission, and Thales ground controllers in Europe will take control of the satellite once it contacts ground stations. Koreasat 5A’s on-board engine will conduct multiple burns to circularize its orbit around 22,300 miles (35,800 kilometers) over the equator a few weeks after launch. Once the satellite passes post-launch tests, Thales will hand over control of Koreasat 5A to KTsat, a subsidiary of South Korea’s KT Corp. based in Seoul. Designed for a 15-year mission, Koreasat 5A is based on Thales’ Spacebus 4000B2 satellite bus and is destined to place Koreasat 5, a communications craft launched in 2006. Koreasat 5A will be parked at 113 degrees east longitude, where its orbital velocity will match the rotation of Earth, allowing the satellite to hover over a fixed location, and remain in the place in the sky in view of ground antennas. The satellite’s solar panels will generate about 6.5 kilowatts of power for its Ku-band communications transmitters and receivers. Koreasat 5A carries 36 Ku-band transponders, providing Internet access, television broadcast and other multimedia services in Korea, Japan, the Philippines, Guam, Southeast Asia, and South Asia. Koreasat 5A will also offer coverage for maritime communications in the Middle East, the Indian Ocean and parts of the Asia-Pacific region.